Cub Scouting is all about adventure! To earn their rank badge, Arrows of Light complete five “adventures,” which are collections of themed, multidisciplinary activities. They also complete safety exercises. Below, you’ll find the exact requirements. 1. Be active in your Webelos den for at least six months since completing the fourth grade or for at least six months since becoming 10 years old. 3. 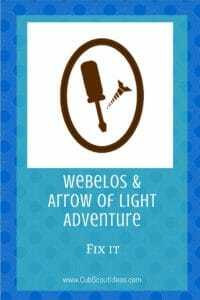 Complete one Webelos/Arrow of Light elective adventure of your den or family’s choosing. Your Cub Scout must complete all five of these adventures to earn his Arrow of Light badge. c. Under the supervision of your parent, guardian, or den leader, connect with a Scout in another country during an event such as Jamboree on the Air or Jamboree on the Internet or by other means. Once your tents are set up, discuss with your den or family what actions you should take in the case of the following extreme weather events. e. Describe what merit badges are and how they are earned. a. Explain the patrol method. Describe the types of patrols that might be part of a troop. 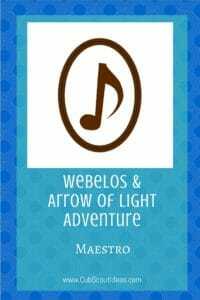 Your Arrow of Light must complete ONE of these adventures to earn his Arrow of Light rank badge. But you aren’t limited to just two–your family or your den may choose to do as many of these as you would like. 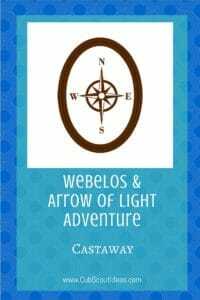 This list also serves as the Webelos elective adventures. d. Create a freestanding sculpture or mobile using wood, metal, papiermâché, or found or recycled objects. c. Discuss what to do if you become lost in the woods. Tell what the letters “ST-O-P” stand for. Tell what the universal emergency signal is. Describe three ways to signal for help. Demonstrate one of them. Describe what you can do to help rescuers find you.